Marshall, Texas) Wiley student Taylor Barnes has been crowned Miss National UNCF. Miss Barnes was named the winner Saturday night during the Miss National UNCF Coronation at the organization’s Annual National Alumni Council Leadership Conference and Alumni Summit in Atlanta, Georgia. Barnes defeated Miss UNCF Queens from competing HBCUs to earn the title. Her win makes her the seventh consecutive Wiley student to be named Miss National UNCF, and the 16th Wileyite to win the title since 1999. Barnes was crowned Miss UNCF for Wiley College in January. She is a sophomore from Chandler, Arizona. She is pursuing a Bachelor of Business Administration degree in Management. She is a member of Wiley’s Emerging Leadership program, the Pre-Alumni Council, and the Student Union Advisory Board. Miss Jefferson, her opponent, is a sophomore from Houston, Texas. Collectively, with financial support from their families, Wiley alumni, and friends of the College, the students raised $53,000 during their Wiley campus campaigns. Barnes, as the winner of Wiley’s title, raised the most funding. The campaign total topped the funds earned by the competing schools, thus earning her the national victory. All the campaign dollars support student scholarships at Wiley and are used to help the College meet an annual UNCF three-to-1 match challenge to its member schools, which is realized by raising a minimum of $100,000. Barnes will spend the next 12 months raising awareness around the country about the value of pursuing and earning a college degree and letting students know that resources are available to help them do so. 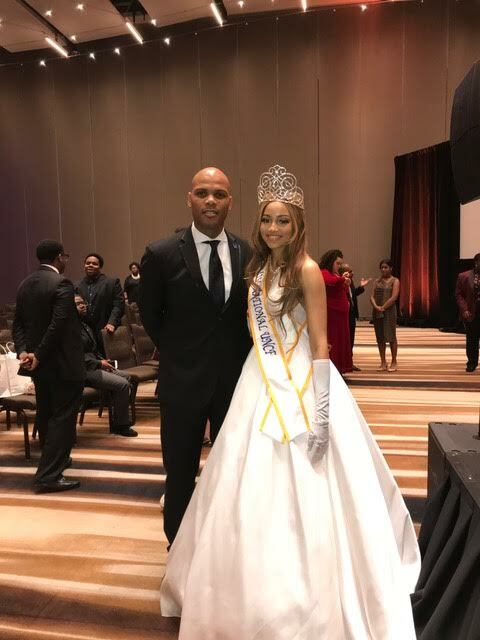 In photo, Miss Barnes is pictured with Wiley College President Herman J. Felton Jr. just after being crowned Miss National UNCF on Saturday night at the coronation during the Annual National Alumni Council Leadership Conference and Alumni Summit in Atlanta, Georgia.